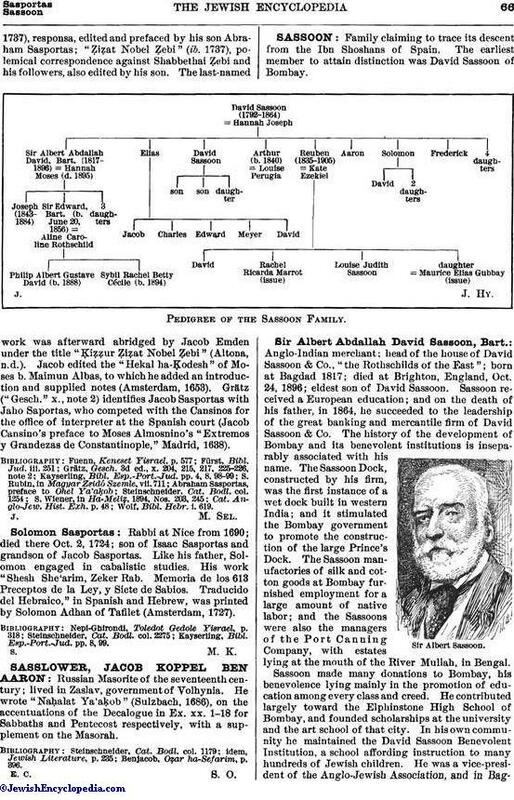 Family claiming to trace its descent from the Ibn Shoshans of Spain. The earliest member to attain distinction was David Sassoon of Bombay. 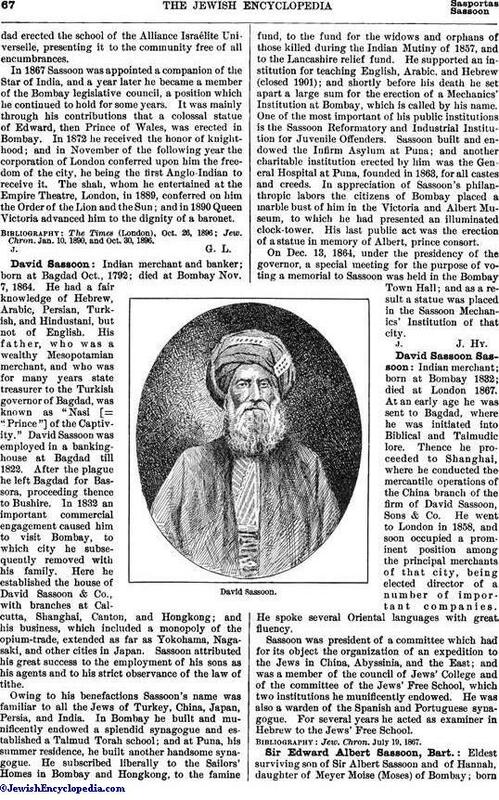 Anglo-Indian merchant; head of the house of David Sassoon & Co., "the Rothschilds of the East"; born at Bagdad 1817; died at Brighton, England, Oct. 24, 1896; eldest son of David Sassoon. Sassoon received a European education; and on the death of his father, in 1864, he succeeded to the leadership of the great banking and mercantile firm of David Sassoon & Co. The history of the development of Bombay and its benevolent institutions is inseparably associated with his name. The Sassoon Dock, constructed by his firm, was the first instance of a wet dock built in western India; and it stimulated the Bombay government to promote the construction of the large Prince's Dock. The Sassoon manufactories of silk and cotton goods at Bombay furnished employment for a large amount of native labor; and the Sassoons were also the managers of the Port Canning Company, with estates lying at the mouth of the River Mullah, in Bengal. Sassoon made many donations to Bombay, his benevolence lying mainly in the promotion of education among every class and creed. He contributed largely toward the Elphinstone High School of Bombay, and founded scholarships at the university and the art school of that city. In his own community he maintained the David Sassoon Benevolent Institution, a school affording instruction to many hundreds of Jewish children. He was a vice-president of the Anglo-Jewish Association, and in Bagdaderected the school of the Alliance Israélite Universelle, presenting it to the community free of all encumbrances. In 1867 Sassoon was appointed a companion of the Star of India, and a year later he became a member of the Bombay legislative council, a position which he continued to hold for some years. It was mainly through his contributions that a colossal statue of Edward, then Prince of Wales, was erected in Bombay. In 1872 he received the honor of knighthood; and in November of the following year the corporation of London conferred upon him the freedom of the city, he being the first Anglo-Indian to receive it. The shah, whom he entertained at the Empire Theatre, London, in 1889, conferred on him the Order of the Lion and the Sun; and in 1890 Queen Victoria advanced him to the dignity of a baronet. Jew. Chron. Jan. 10, 1890, and Oct. 30, 1896. 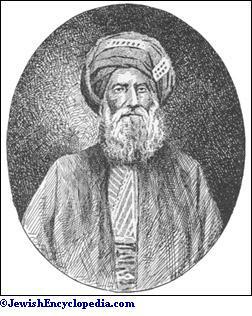 Indian merchant and banker; born at Bagdad Oct., 1792; died at Bombay Nov. 7, 1864. He had a fair knowledge of Hebrew, Arabic, Persian, Turkish, and Hindustani, but not of English. His father, who was a wealthy Mesopotamian merchant, and who was for many years state treasurer to the Turkish governor of Bagdad, was known as "Nasi [= "Prince"] of the Captivity." David Sassoon was employed in a banking-house at Bagdad till 1822. After the plague he left Bagdad for Bassora, proceeding thence to Bushire. In 1832 an important commercial engagement caused him to visit Bombay, to which city he subsequently removed with his family. Here he established the house of David Sassoon & Co., with branches at Calcutta, Shanghai, Canton, and Hongkong; and his business, which included a monopoly of the opium-trade, extended as far as Yokohama, Nagasaki, and other cities in Japan. Sassoon attributed his great success to the employment of his sons as his agents and to his strict observance of the law of tithe. Owing to his benefactions Sassoon's name was familiar to all the Jews of Turkey, China, Japan, Persia, and India. 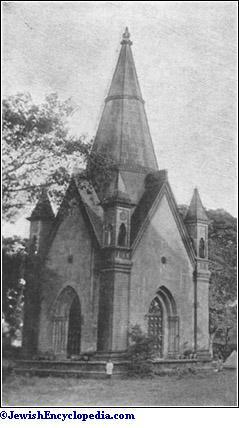 In Bombay he built and munificently endowed a splendid synagogue and established a Talmud Torah school; and at Puna, his summer residence, he built another handsome synagogue. He subscribed liberally to the Sailors' Homes in Bombay and Hongkong, to the famine fund, to the fund for the widows and orphans of those killed during the Indian Mutiny of 1857, and to the Lancashire relief fund. He supported an institution for teaching English, Arabic, and Hebrew (closed 1901); and shortly before his death he set apart a large sum for the erection of a Mechanics' Institution at Bombay, which is called by his name. One of the most important of his public institutions is the Sassoon Reformatory and Industrial Institution for Juvenile Offenders. Sassoon built and endowed the Infirm Asylum at Puna; and another charitable institution erected by him was the General Hospital at Puna, founded in 1863, for all castes and creeds. In appreciation of Sassoon's philanthropic labors the citizens of Bombay placed a marble bust of him in the Victoria and Albert Museum, to which he had presented an illuminated clock-tower. His last public act was the erection of a statue in memory of Albert, prince consort. On Dec. 13, 1864, under the presidency of the governor, a special meeting for the purpose of voting a memorial to Sassoon was held in the Bombay Town Hall; and as a result a statue was placed in the Sassoon Mechanics' Institution of that city. Indian merchant; born at Bombay 1832; died at London 1867. At an early age he was sent to Bagdad, where he was initiated into Biblical and Talmudic lore. Thence he proceeded to Shanghai, where he conducted the mercantile operations of the China branch of the firm of David Sassoon, Sons & Co. He went to London in 1858, and soon occupied a prominent position among the principal merchants of that city, being elected director of a number of important companies. He spoke several Oriental languages with great fluency. Sassoon was president of a committee which had for its object the organization of an expedition to the Jews in China, Abyssinia, and the East; and was a member of the council of Jews' College and of the committee of the Jews' Free School, which two institutions he munificently endowed. He was also a warden of the Spanish and Portuguese synagogue. For several years he acted as examiner in Hebrew to the Jews' Free School. Jew. Chron. July 19, 1867. Eldest surviving son of Sir Albert Sassoon and of Hannah, daughter of Meyer Moise (Moses) of Bombay; bornin that city June 20, 1856; succeeded to the baronetcy in 1896 on the death of Sir Albert Sassoon. He is a graduate of London University, a major in the Duke of Cambridge's Hussars Yeomanry, and a deputy lieutenant. In March, 1899, he was elected member of Parliament for Hythe in the Unionist interest. In Feb., 1902, on the resignation of Sir Joseph Sebag Montefiore, Sir Edward was elected president of the London Spanish and Portuguese Congregation; and he is a vice-president of Jews' College and of the Anglo-Jewish Association. Tomb of David Sassoon, Puna, India. In 1887 he married Aline Caroline, daughter of Baron Gustave de Rothschild. Indian merchant and banker; born in 1819; died at Colombo 1880. 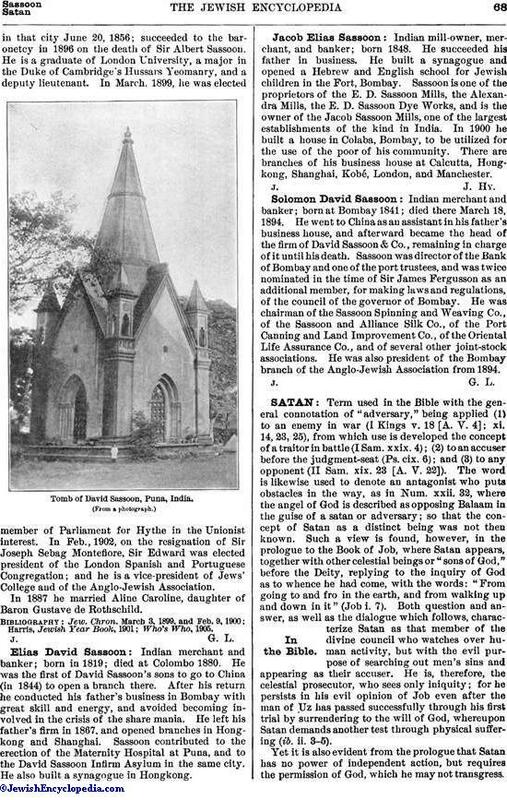 He was the first of David Sassoon's sons to go to China (in 1844) to open a branch there. After his return he conducted his father's business in Bombay with great skill and energy, and avoided becoming involved in the crisis of the share mania. He left his father's firm in 1867, and opened branches in Hongkong and Shanghai. Sassoon contributed to the erection of the Maternity Hospital at Puna, and to the David Sassoon Infirm Asylum in the same city. He also built a synagogue in Hongkong. Indian mill-owner, merchant, and banker; born 1848. He succeeded his father in business. He built a synagogue and opened a Hebrew and English school for Jewish children in the Fort, Bombay. Sassoon is one of the proprietors of the E. D. Sassoon Mills, the Alexandra Mills, the E. D. Sassoon Dye Works, and is the owner of the Jacob Sassoon Mills, one of the largest establishments of the kind in India. In 1900 he built a house in Colaba, Bombay, to be utilized for the use of the poor of his community. There are branches of his business house at Calcutta, Hongkong, Shanghai, Kobé, London, and Manchester. Indian merchant and banker; born at Bombay 1841; died there March 18, 1894. He went to China as an assistant in his father's business house, and afterward became the head of the firm of David Sassoon & Co., remaining in charge of it until his death. Sassoon was director of the Bank of Bombay and one of the port trustees, and was twice nominated in the time of Sir James Fergusson as an additional member, for making laws and regulations, of the council of the governor of Bombay. He was chairman of the Sassoon Spinning and Weaving Co., of the Sassoon and Alliance Silk Co., of the Port Canning and Land Improvement Co., of the Oriental Life Assurance Co., and of several other joint-stock associations. He was also president of the Bombay branch of the Anglo-Jewish Association from 1894.